Archbishop Robert J. Carlson of St. Louis urged protesters to turn away from violence as a new round of protests began over the shooting death of African-American teenager Michael Brown this past summer in the small town of Ferguson. The protests were to take place not only in Ferguson, where Brown was fatally shot by a white Ferguson police officer, Darren Wilson, but also in St. Louis under the banner "Ferguson October." "The sin of racism in our cities and our nation must be dealt with, but never with violence," Archbishop Carlson said in an Oct. 10 message titled "A Call for Peace in Our Community." "There are small but vocal groups currently threatening violence. I urge anyone who feels the desire to violently lash out to first pause and consider the potential consequences of their actions," Archbishop Carlson said. "Will violence make the situation right? Will it right the wrongs? Or will it only make things worse? The unrelenting desire for revenge is a poison that seeps into our souls and can become contagious carrying with it a commitment to violence." A St. Louis County grand jury has been looking into the Brown shooting to determine what if any charges should be filed against Warren. The 18-year-old was unarmed, but police say Brown struggled with Wilson before the officer fired. The shooting in August gave rise to weeks of protests, violence in the streets, and looting and vandalism of Ferguson businesses. Activists threaten more such action if the officer is not brought up on charges. In recent weeks, there have been three other fatal police shootings in the St. Louis area. The most recent was Oct. 9. A white St. Louis officer who was working off duty killed a black youth, 18-year-old Vonderrit D. Myers. AP reported that police say Myers opened fire, while the youth's parents claim he was unarmed. In his statement issued before the weekend of protests, the archbishop quoted the Rev. Martin Luther King Jr., who said, "Returning violence for violence multiplies violence, adding deeper darkness to a night already devoid of stars. ... Hate cannot drive out hate: only love can do that." Archbishop Carlson said, "It is no longer the time to ask, 'What would Jesus do?' It is time to ask 'What is Jesus doing?' What Jesus is not doing is adding violence to violence. "Remember what he said to his disciples in the Gospel of Luke when they asked if they should call down fire from heaven to consume a town that didn't welcome him? He rebuked them. Jesus is also not ignoring the problem and hoping it will go away! What Jesus is doing is pleading with us to listen to each other, respect each other and help each other." The archbishop added, "That's the same Jesus who said, 'Blessed are the peacemakers, for they will be called children of God.' Christ calls us to promote peace, not provoke violence. Our Lord himself suffered the most terrible of injustices, because although incapable of doing wrong, he was nevertheless condemned to suffer and die on the cross. And when one of his disciples responded by lashing out in violence he said, 'Put away your sword!'" By departing from "God's blueprint," the archbishop said, "the fruit of our thoughts and actions will not be peace but its opposite -- force and violence!" Addressing the issues behind the new round of protests, Archbishop Carlson said, "By now we should all realize that there is no going back to the status quo following the tragic shooting of Michael Brown. Rightly so! The status quo was not good enough. This tragedy has left a community struggling to cope with anger and frustration that it had repressed for many years. "Now is our moment of truth. We can let the anger and frustration spill over in violence, and then be repressed again. Or we can take the opportunity to break the cycle and address the underlying issues that cause the anger and frustration." AP reported that as of late Oct. 12 police had arrested 17 protesters in the weekend protests. 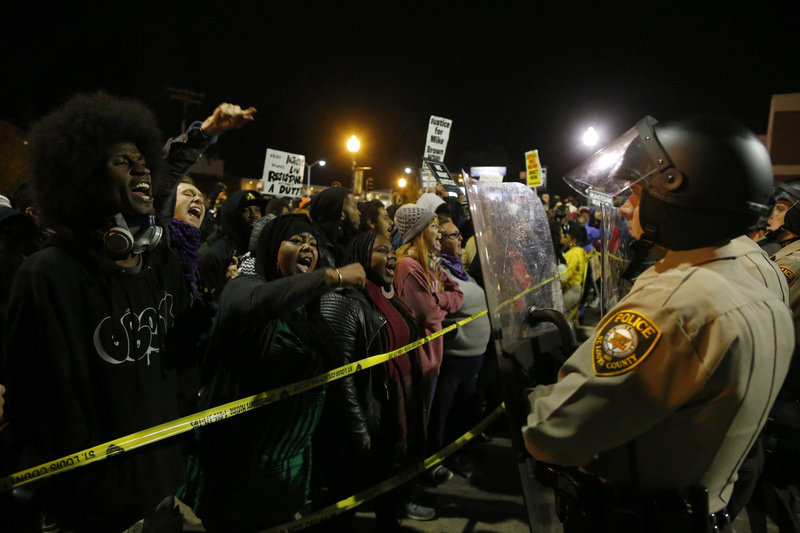 Archbishop Carlson said the issues at stake " are bigger than Ferguson. They are as deep as the hold of sin on the human heart and as broad as the solidarity of the entire human race. That means we will not be able to fix things quickly. But we have to move forward. And it is not just Ferguson or the greater St. Louis metropolitan community, but the entire country and the whole church that needs to look at these issues." He asked, "Is it not a sad reality that we integrated professional baseball and schools a long time ago, but we have not integrated everyone's heart?"